Countdown accelerates to Microsoft Exchange Conference – worth attending? As I write, there are 67 days to go before the new, improved, and so much better Microsoft Exchange Conference (MEC) returns after its ten-year hiatus. Even though I have attending far too many IT conferences in Orlando, I’ll be there when MEC swings into high gear on September 24, and not just because my beaming face appears on the MEC web site! Actually, looking at the photos (above), they resemble a line-up of mug-shots taken at a police station, but that’s not important right now… In fact, the photos were taken last February. Microsoft holds an annual summit meeting for the people it recognized as Most Valuable Professionals (MVPs). Normally the summit is held at Microsoft’s HQ in Redmond, WA to make it easy to interact with the product engineering groups and the MEC team took the chance to film a number of the MVPs (with our agreement) to help publicize the event. To return to MEC, after this week’s Office 2013 announcements, including the availability of a preview version of Exchange 2013 (see my notes about installing Exchange 2013), some might wonder why they should spend all the money and effort to go to MEC. After all, you can download and install the preview versions of Exchange 2013 and the other Office 2013 products to gain experience and insight into the technology through your own test deployment. A mass of commentary has already appeared about the new features that appear Exchange 2013 like the Exchange Administration Center (EAC), the browser-based successor to the MMC-based Exchange Management Console (EMC), and you can expect to see a stream of similar articles appear in blogs, including the Exchange group’s own EHLO blog, over the next few months. With such information at our fingertips, is there any good reason to go to MEC? The “Top 10 reasons” described on the MEC site is a good start, but I think that the answer comes down to a single word: “community”. If you place a high value on interacting with other professionals to learn about technology and to pursue to often over-hyped concept of “best practice”, then events like MEC are great places to meet people who can help you to understand, deploy, manage, and master technology. It’s also true that the opportunity to hear Exchange engineers describe the technology that they work on can provide a unique insight that is unobtainable elsewhere. Often insight happens by ignoring the formal PowerPoint slides, which will have been refined to the nth degree by the tender care of Microsoft’s graphic artists and PR teams, and listening instead to how the engineers describe technology, the weight and emphasis that they attach to specific points, the way that they answer questions (or not), their willingness to explore issues, and perhaps the chance to sit down with engineers over a coffee (or some other suitable beverage) afterwards to discuss their work in more detail. Blogs and articles are great, but hearing about technology from the proverbial horse’s mouth is a different matter. I anticipate that Microsoft will flood MEC with engineers from the Exchange 2013 development teams who can answer questions such as “how can I get my existing 100,000 public folder implementation over to Exchange 2013”. At least, I hope that they do and don’t commit the faux pas of international MEC events in the late 1990s and early 2000s when Microsoft attempted to restrain travel costs by sending a small group of engineers and program managers to deliver sessions. All this resulted in was a fatal lack of quality when compared to the U.S. version of MEC. Most of the speakers did well when they discussed their own area of expertise, but asking someone who worked on (for example) the management or migration tools to discuss the finer points of high availability was a disaster waiting to happen, and it often did happen. If only because they want the relaunched MEC to be successful, I don’t think Microsoft will make the same mistake in Orlando. 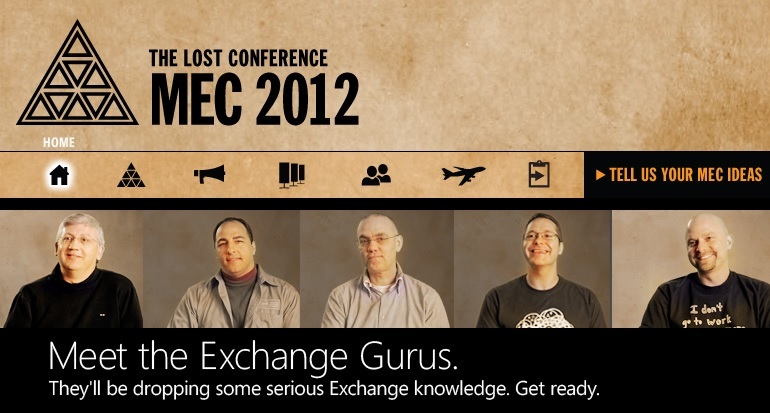 If you attend MEC, I anticipate that you’ll have the chance to listen to engineers who work on all parts of Exchange 2013 and Exchange 2010 and cover the three platforms that Exchange runs on (on-premises, hybrid, and cloud). But Microsoft is not the source of all good information. MEC will have many other interesting sources to tap, including MVPs and administrators and planning from the companies who participate in Microsoft’s Technology Adoption Program (TAP), who have had the chance to run early versions of Exchange 2013 in production. These people can be a rich vein of otherwise unobtainable information that provide the essential facts to underpin a successful deployment. They are also great contacts to have when you need further information in the future. After all, it’s much easier to begin a conversation with someone when you share a common experience. It’s impossible to put a value on community, connections, and insight. At least, not a value that can satisfy the kind of management and beancounters with whom “Dilbert” has to cope. If you’re in the situation where you have to make a case to attend MEC, I think you should focus on some specific technical issues that your company has to face over the next few years and tie your attendance at MEC to the pursuit of information that will help to resolve the problems. I think that’s a reasonable approach to take – at least it was one that I was sympathetic to when I was signing travel requests! This entry was posted in Uncategorized and tagged Exchange 2013, MEC, MECisBack, Microsoft Exchange Conference. Bookmark the permalink.